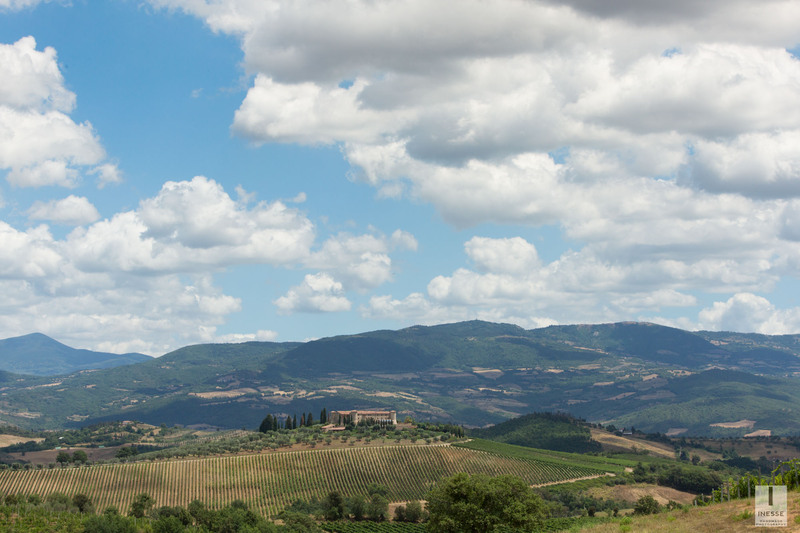 We are in the province of Grosseto, in the heart of the Tuscan Maremma, Italy. 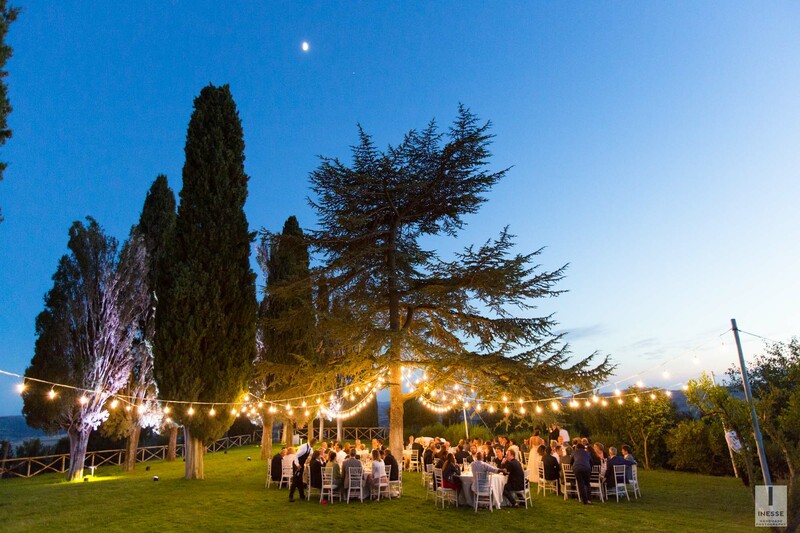 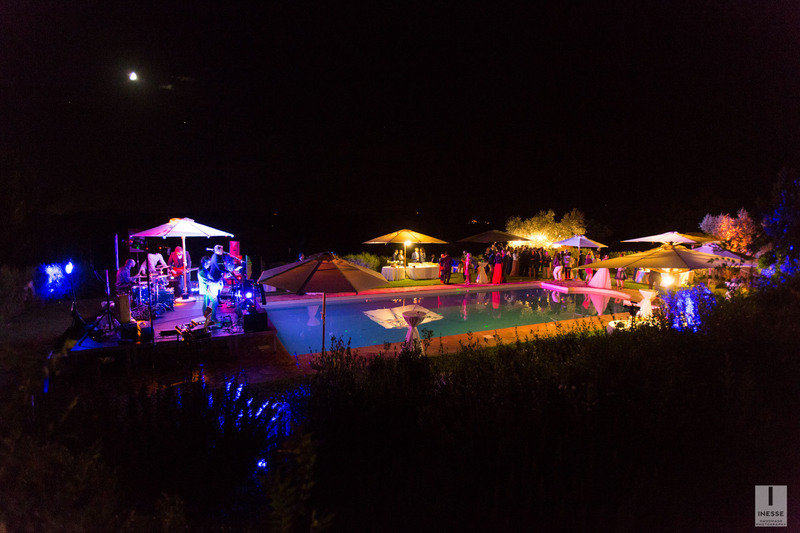 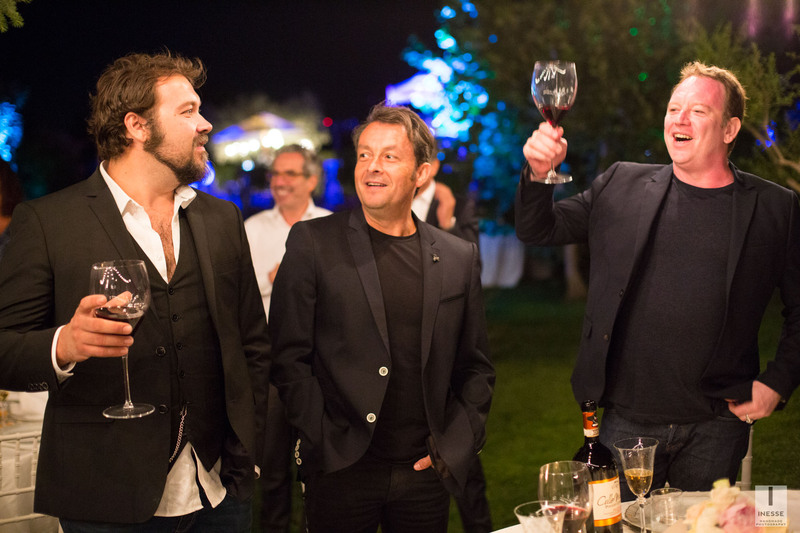 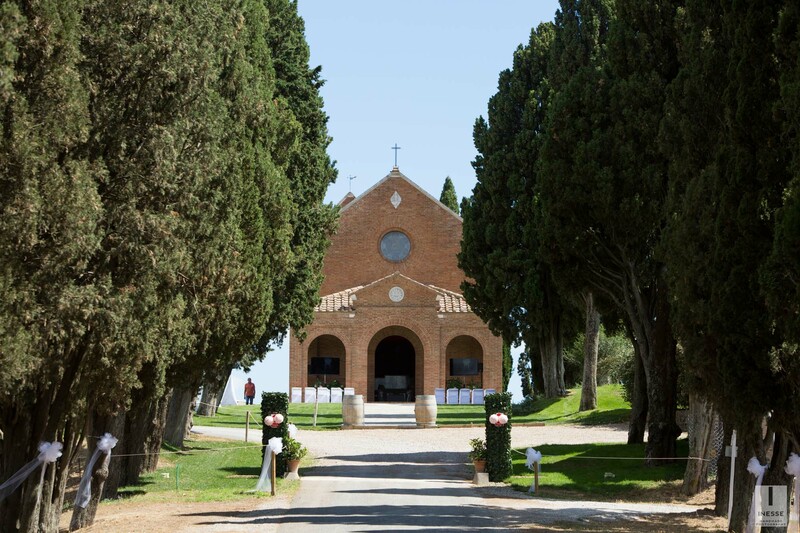 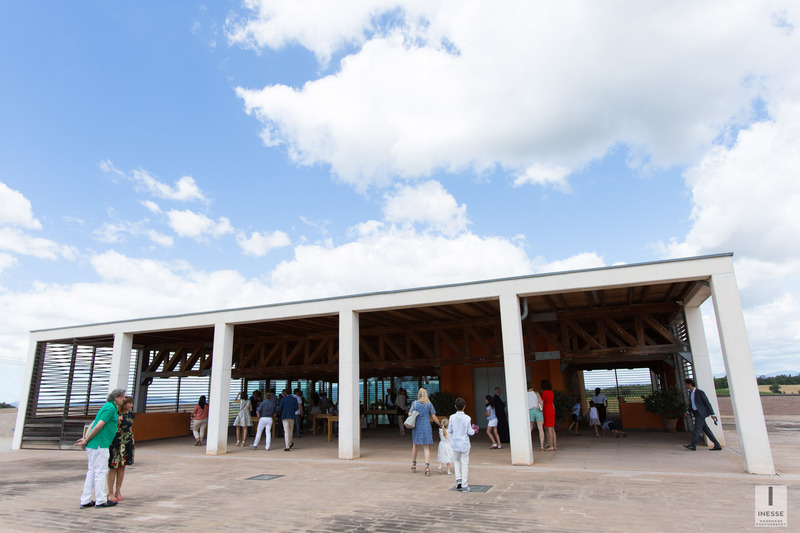 Here stands the Tenuta Collemassari Montecucco, an amazing location desired by many couples for the day of the wedding. 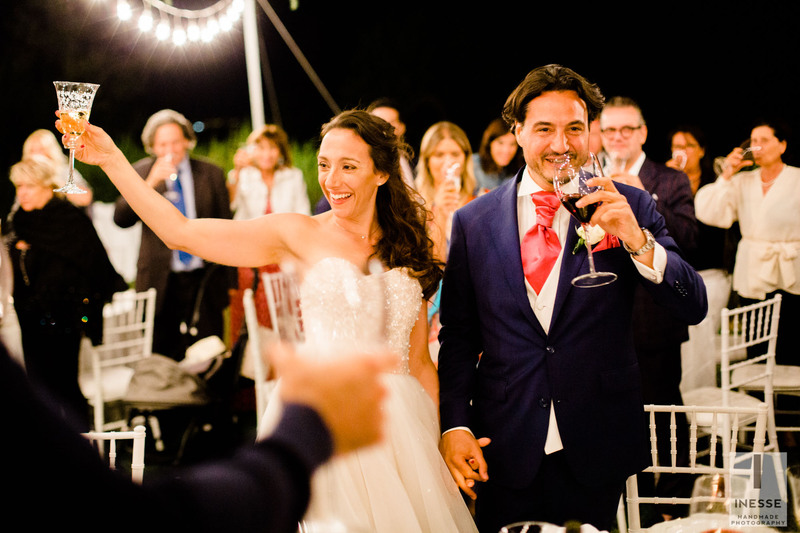 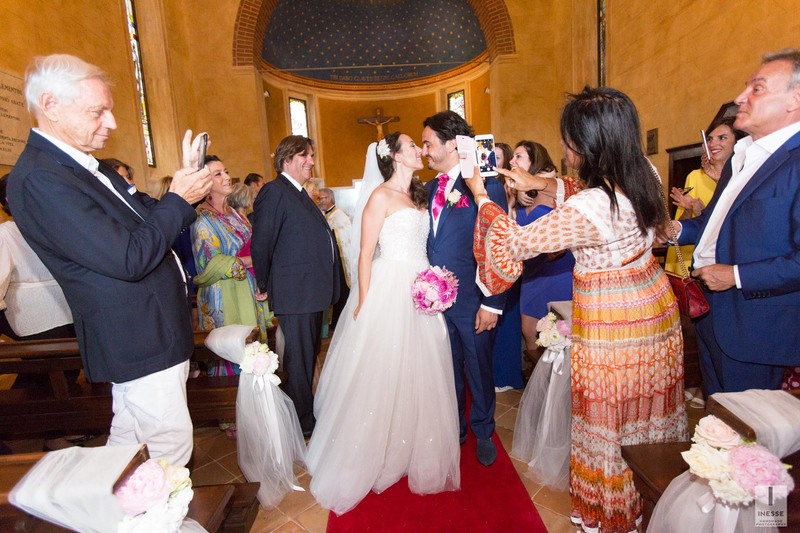 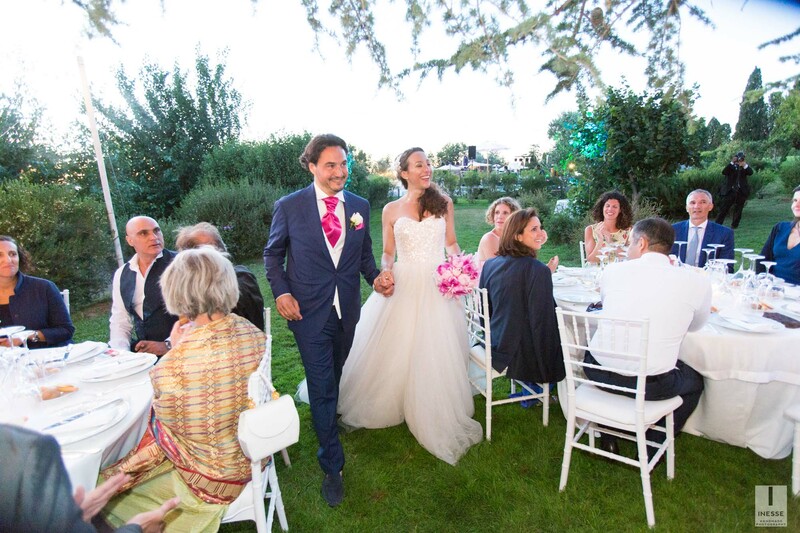 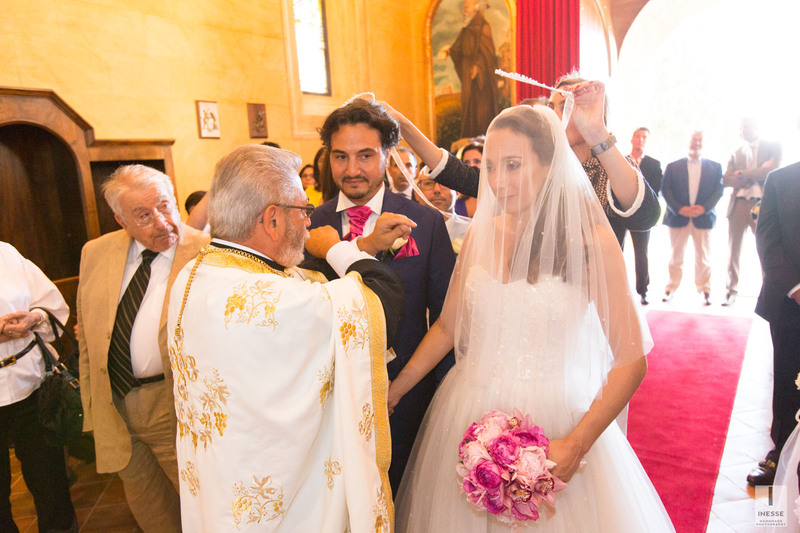 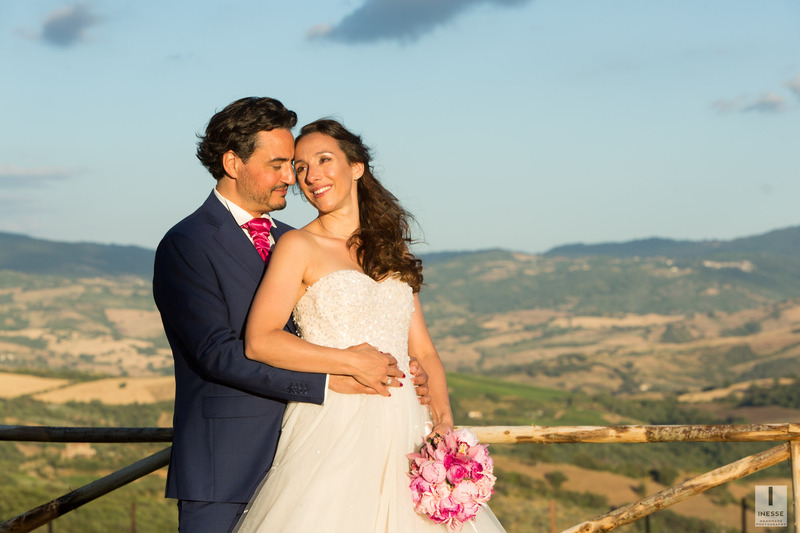 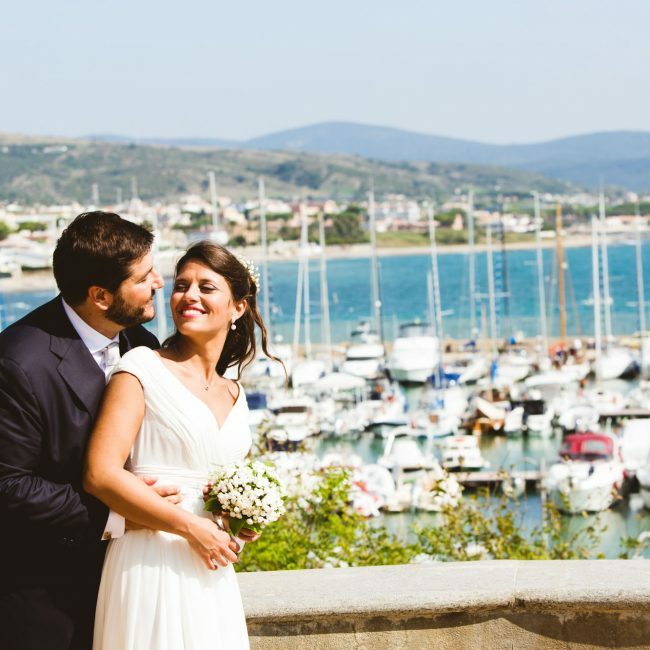 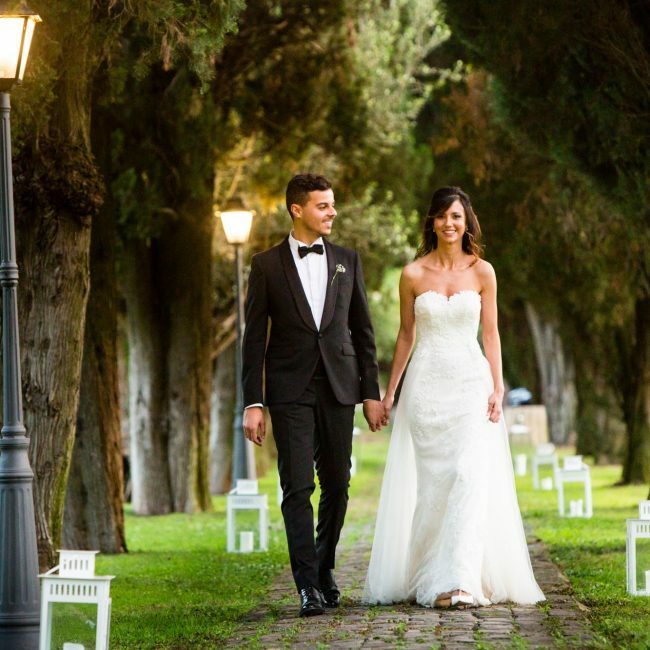 Elodie and Firas are Lebanese, already mother and father of three beautiful children and have chosen one of the most enchanting regions of Italy to get married on a pleasant and clear day in early July. 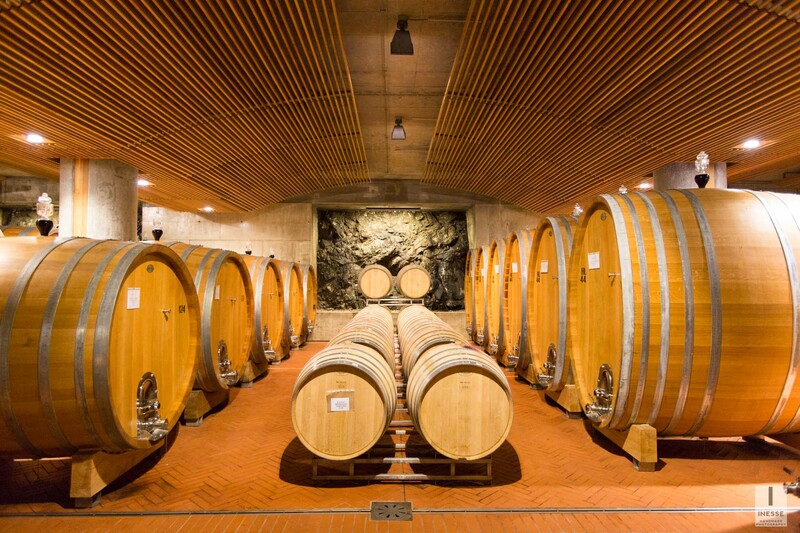 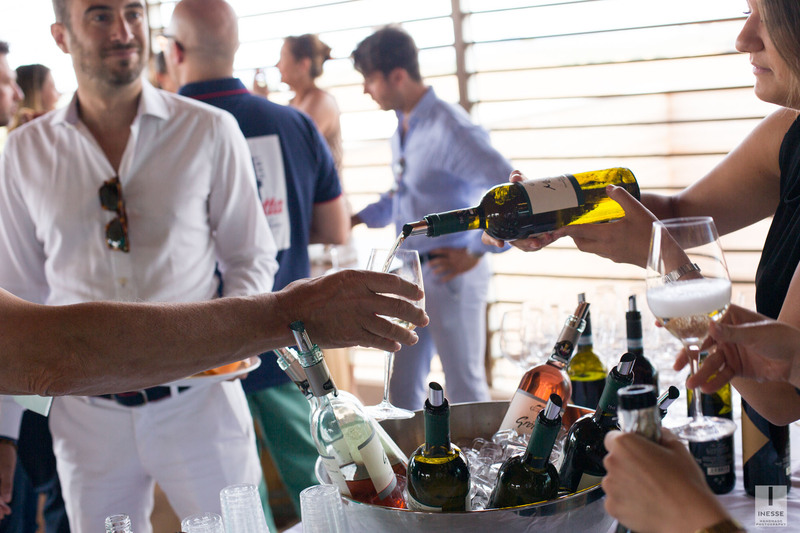 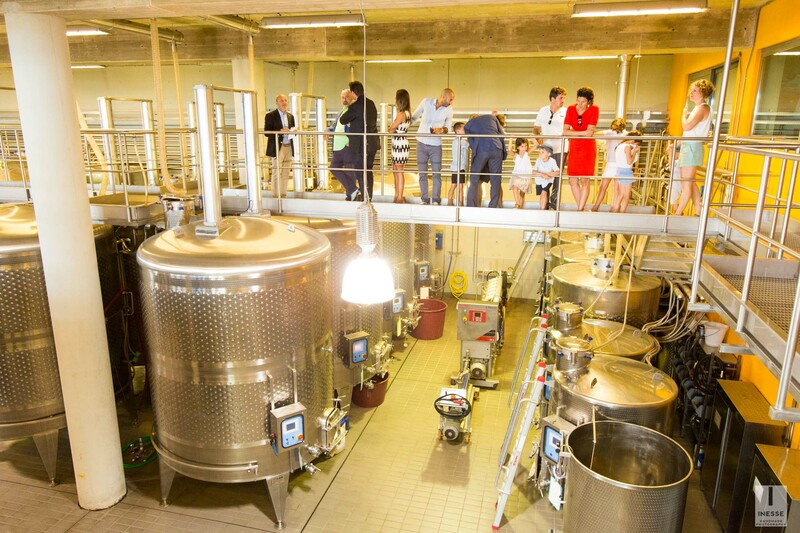 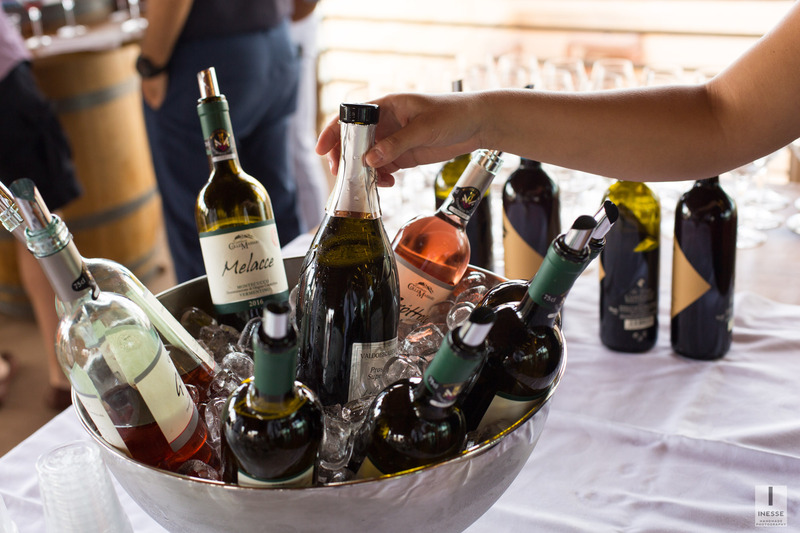 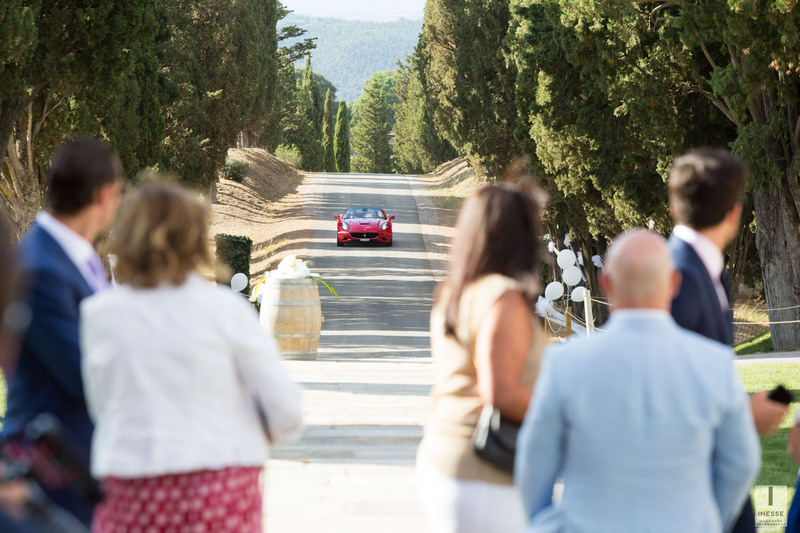 Between Monte Amiata and the beautiful hills of the Val d’Orcia, friends and relatives of the bride and groom spent the morning discovering the wineries, tasting the wines and visiting the cellars of the estate. 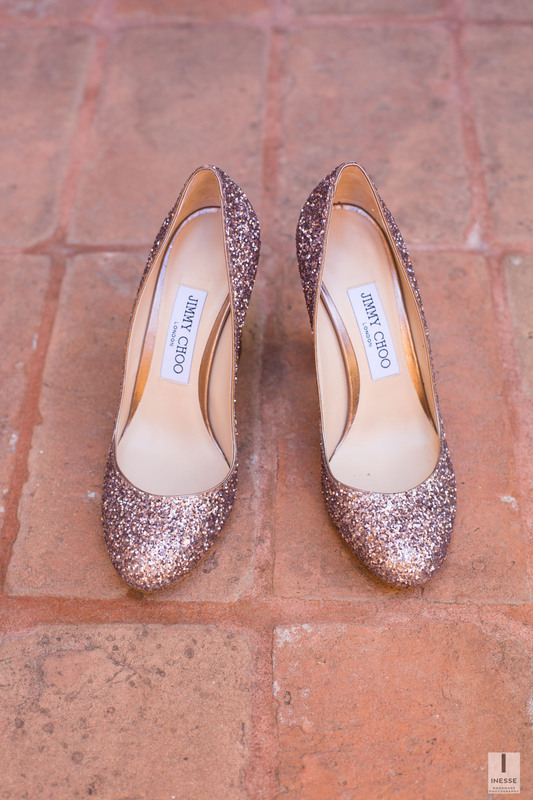 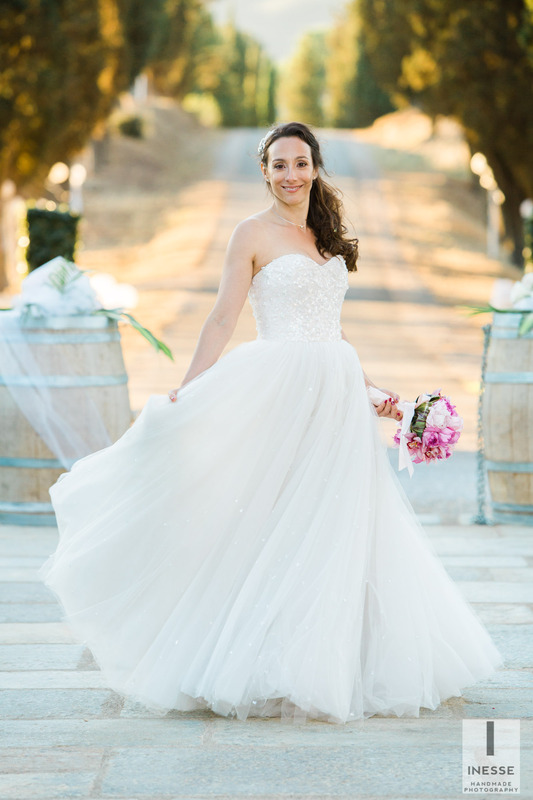 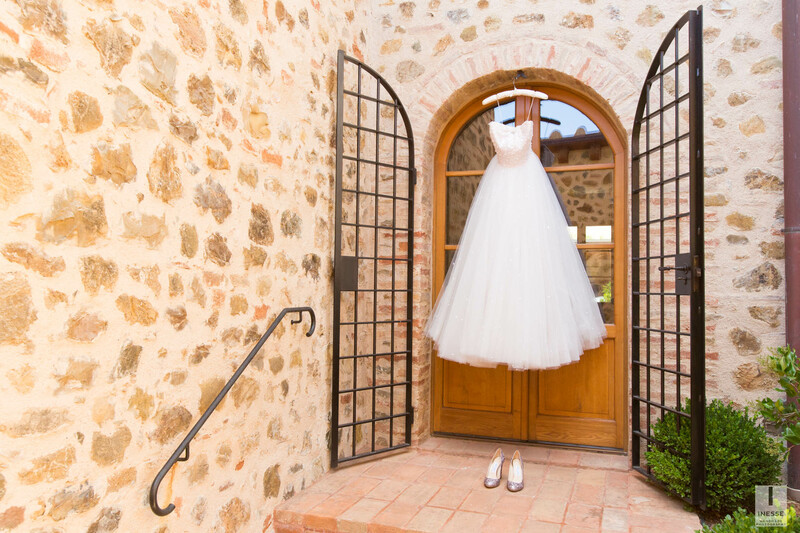 Elodie has chosen a white dress with bare shoulders, heart-shaped bodice and a large tulle skirt, made even more precious and elegant thanks to the enchanting Jimmy Choo shoes, the dream of all brides. 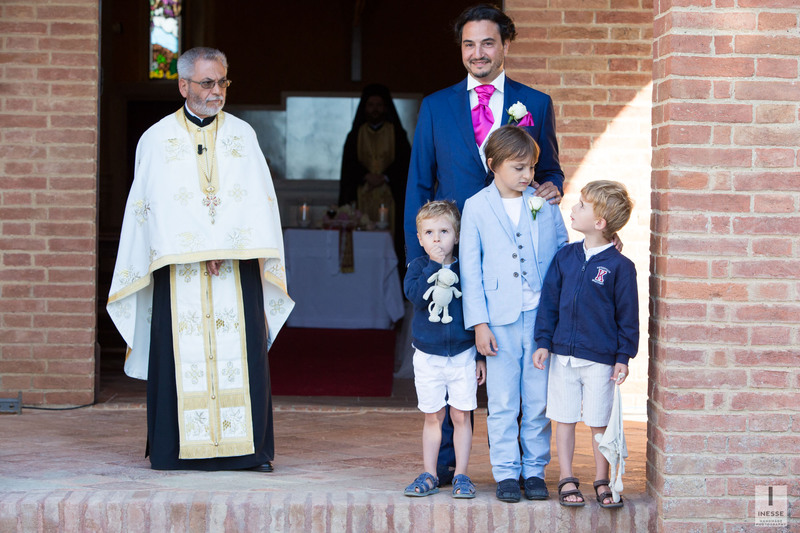 The groom waited for her bride at the entrance of the church with his children, surrounded by the smiles and the cures of his friends. 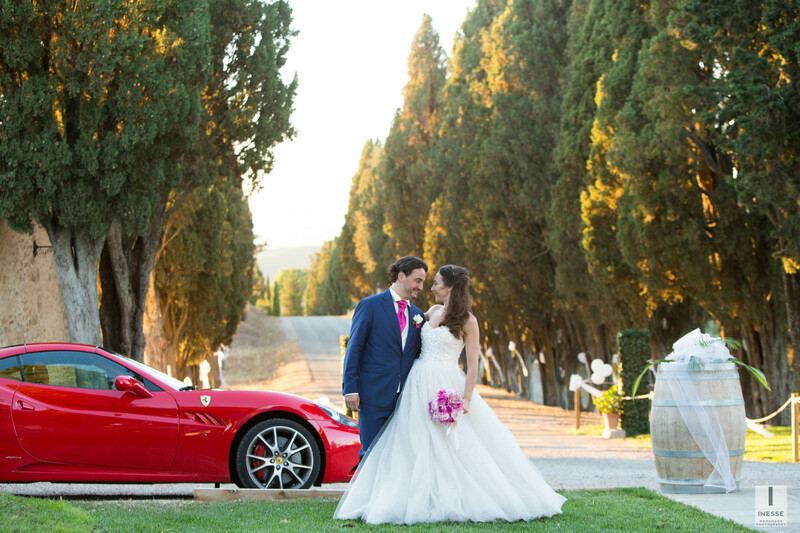 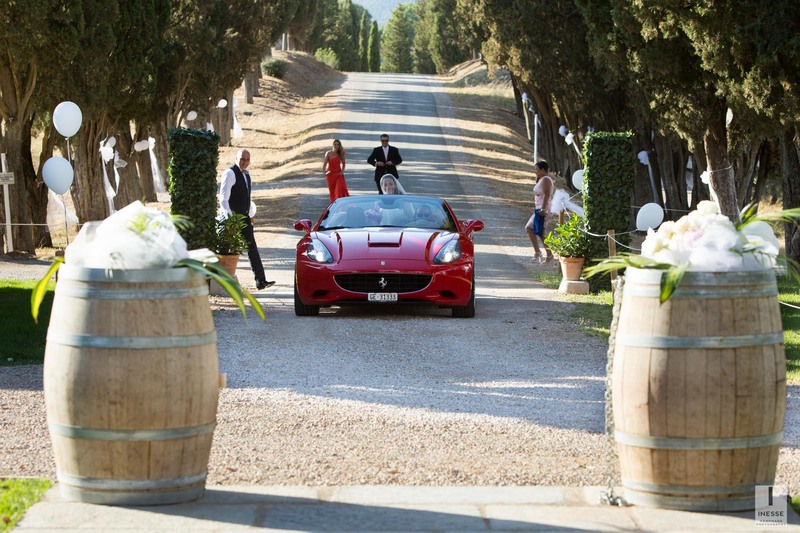 The bride’s wait was short and her arrival was unforgettable, on a blazing red Ferrari. 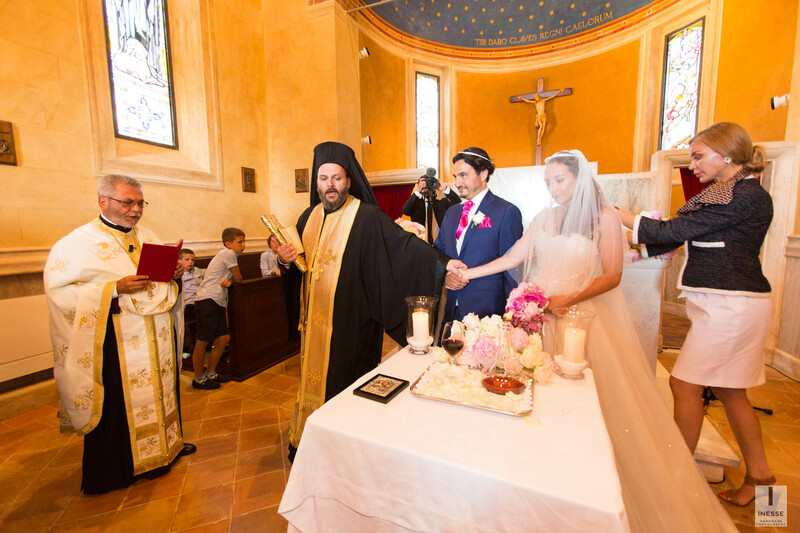 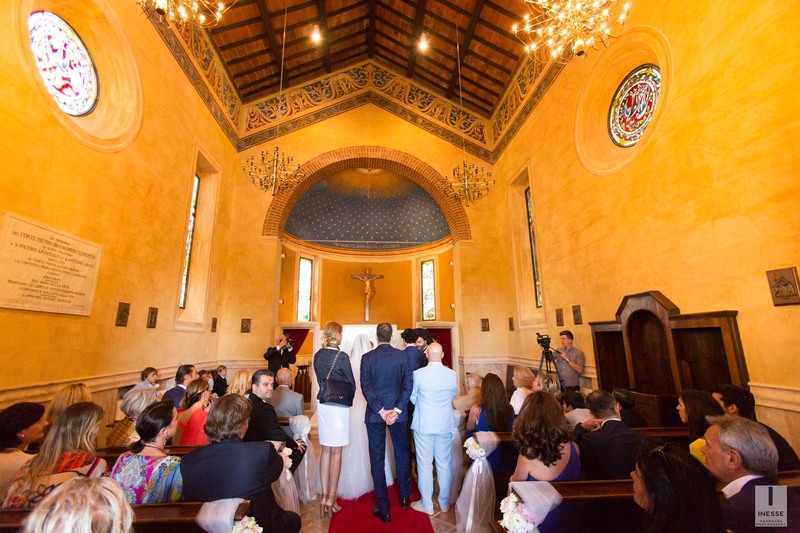 The orthodox wedding was held in the small but refined church of the estate. 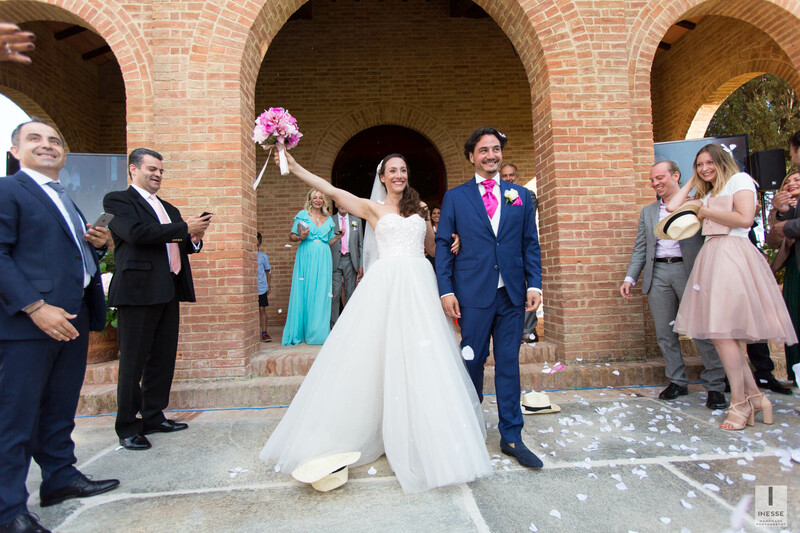 After the ceremony we took advantage of the splendid landscape to take some pictures at the couple, by emphasising the naturalness of the light and the authenticity of the moment. 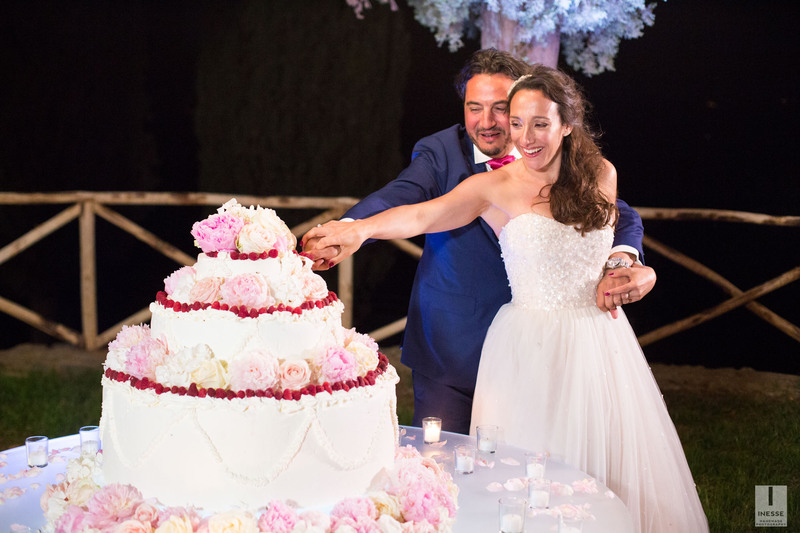 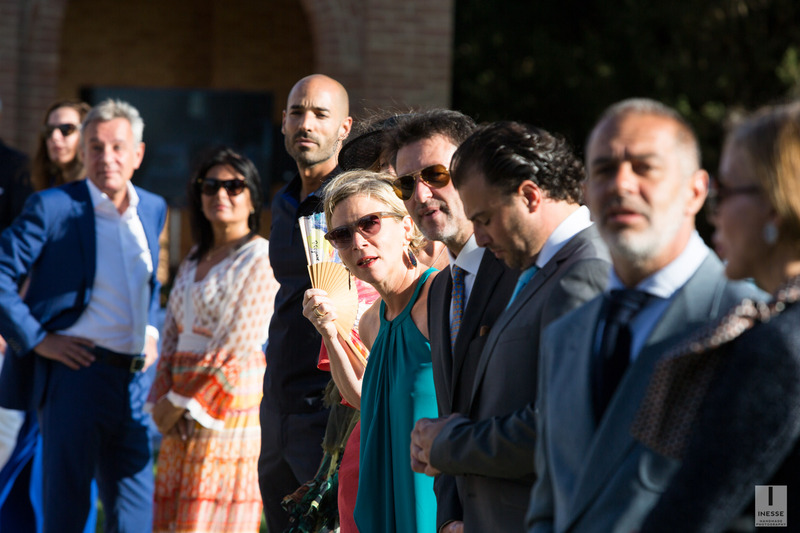 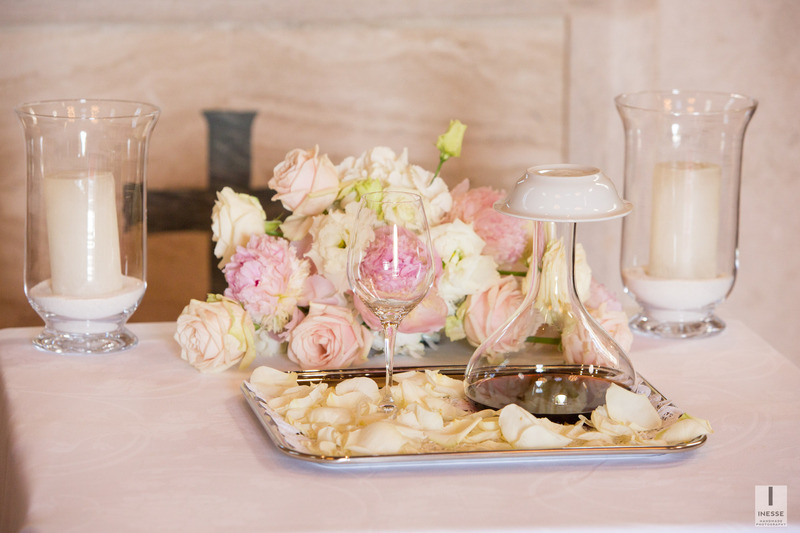 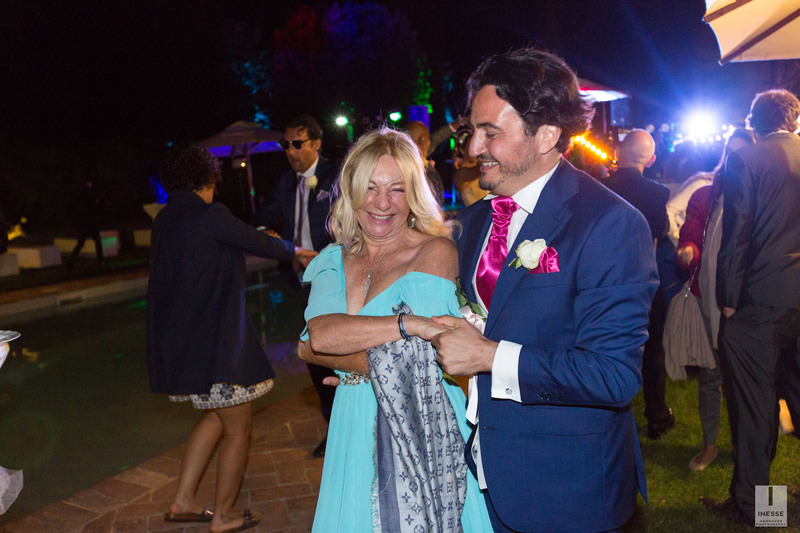 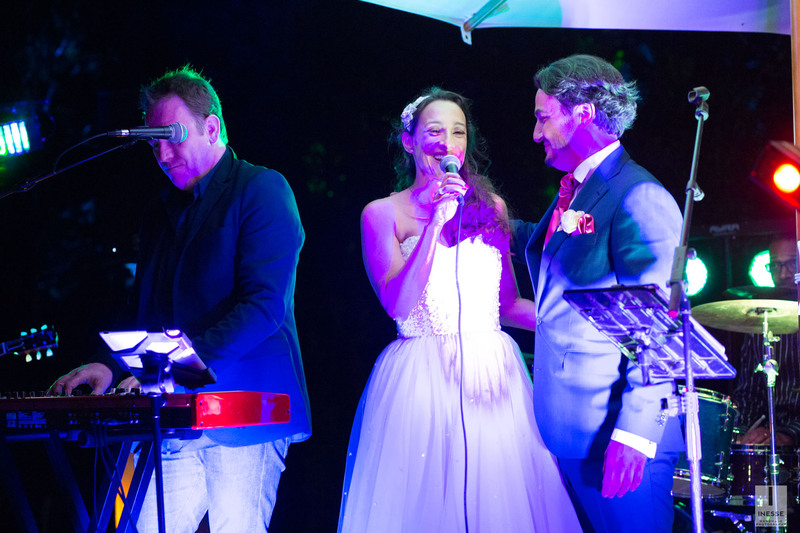 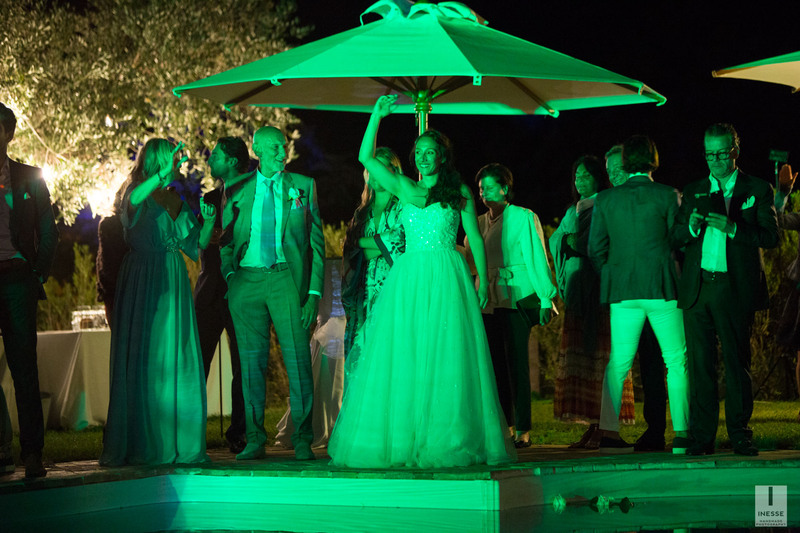 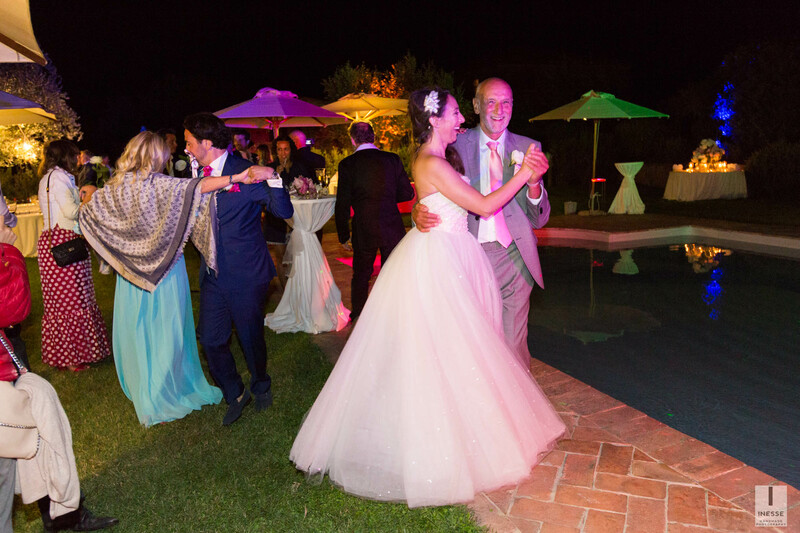 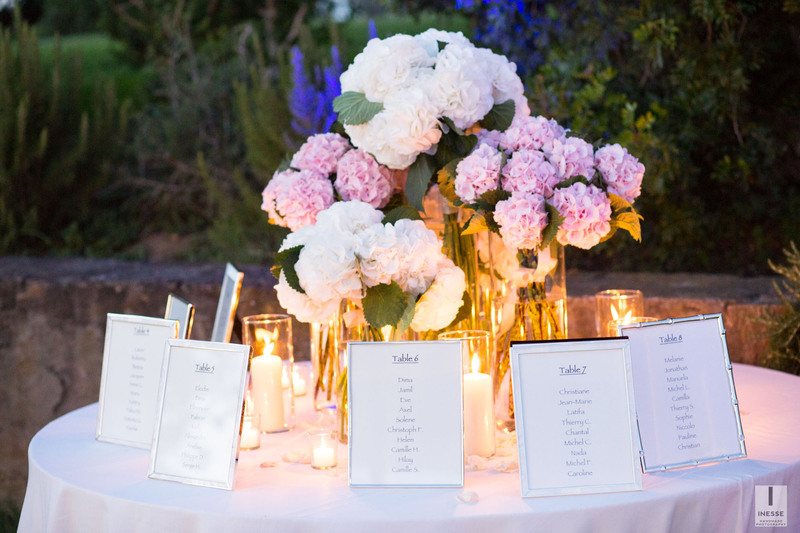 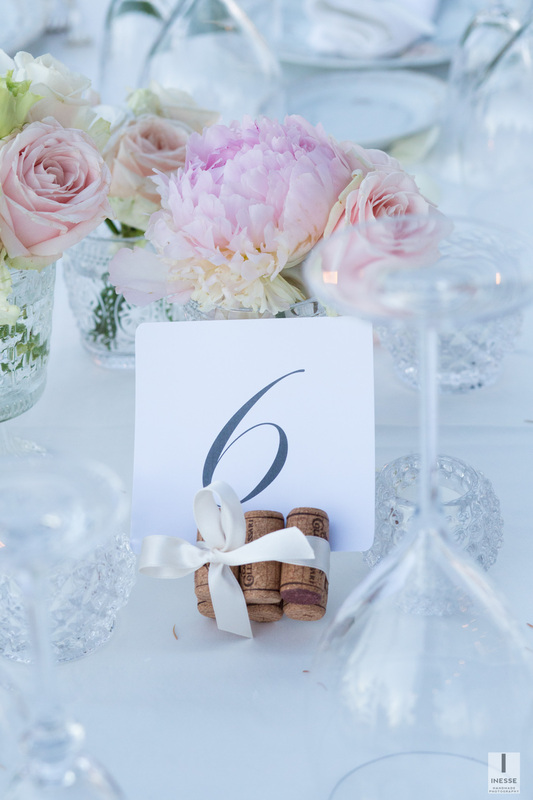 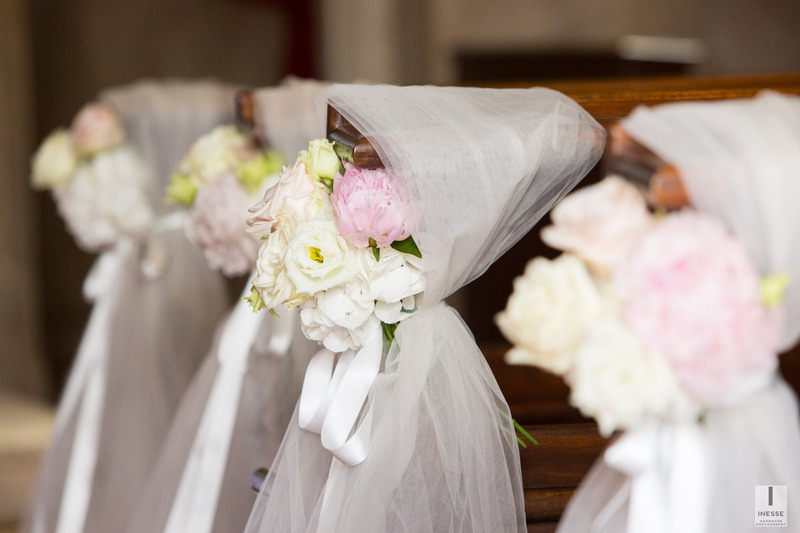 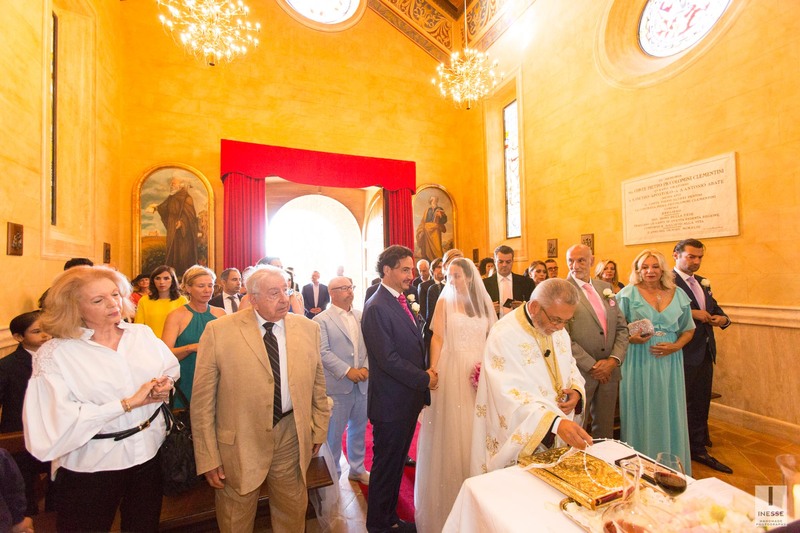 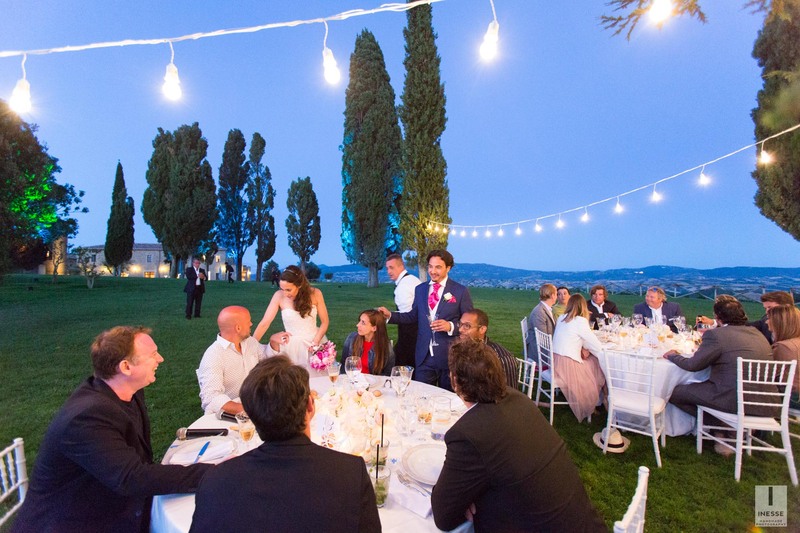 The floral decorations for the ceremony and reception were arranged by the attentive hands of Liliana and Stefania by Verdi Voglie of Terni, the catering service was entrusted to the experience of Alfonso Muzzi. 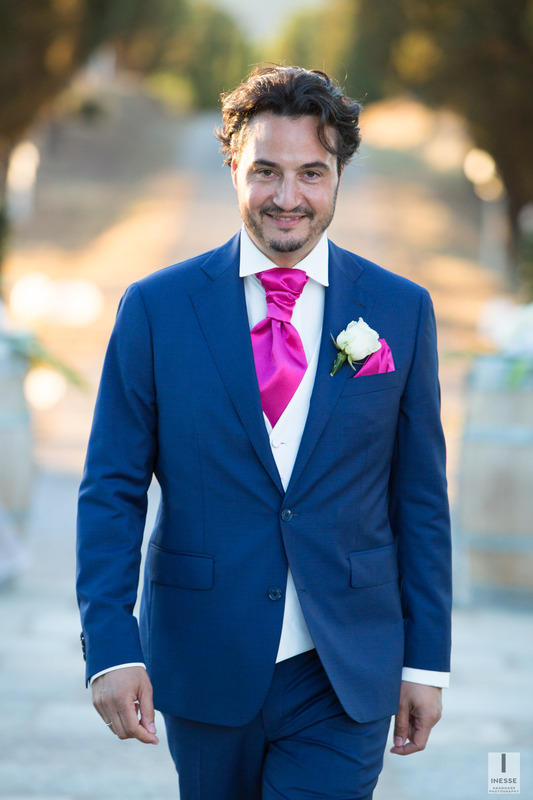 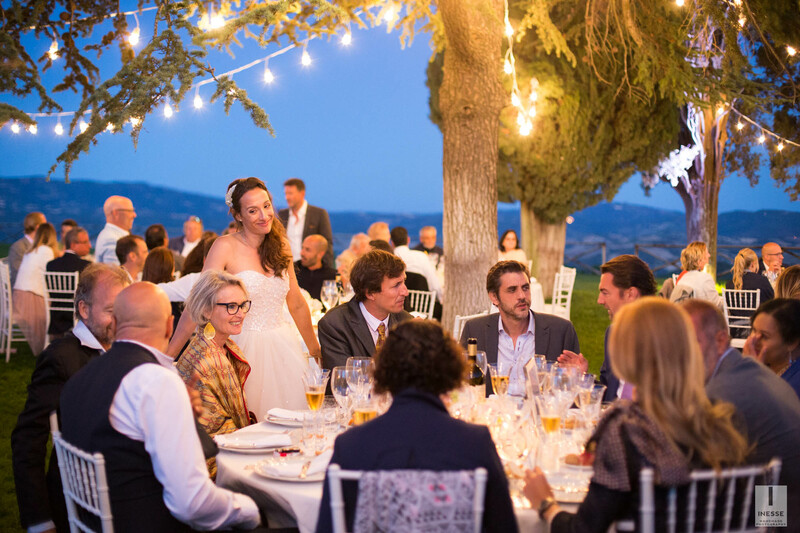 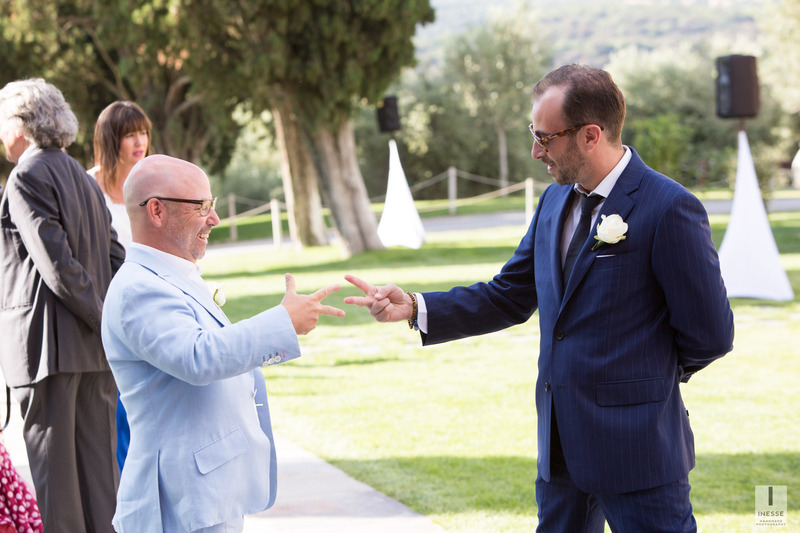 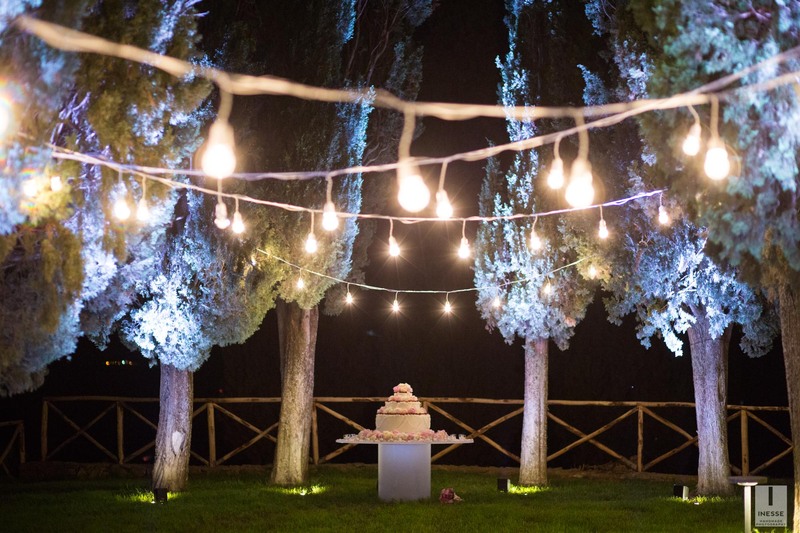 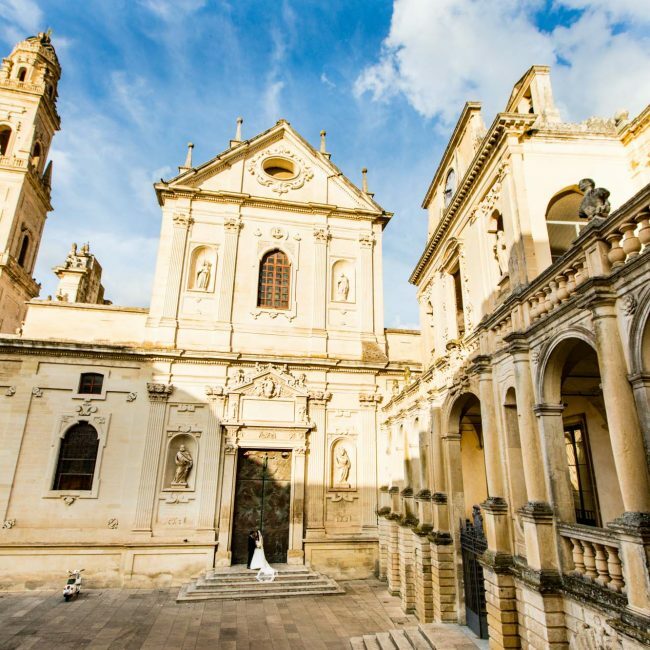 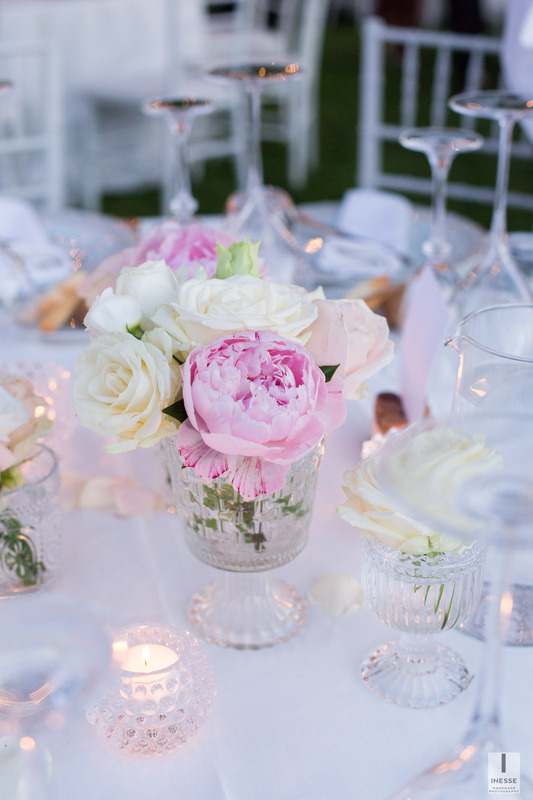 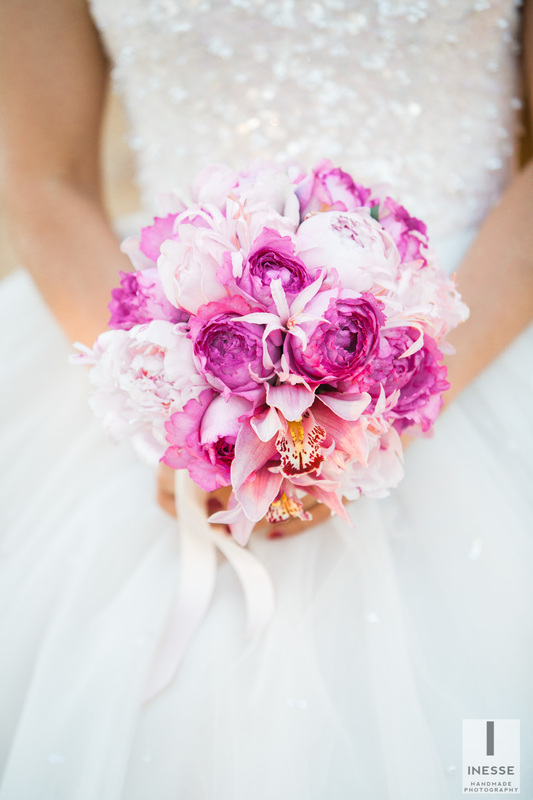 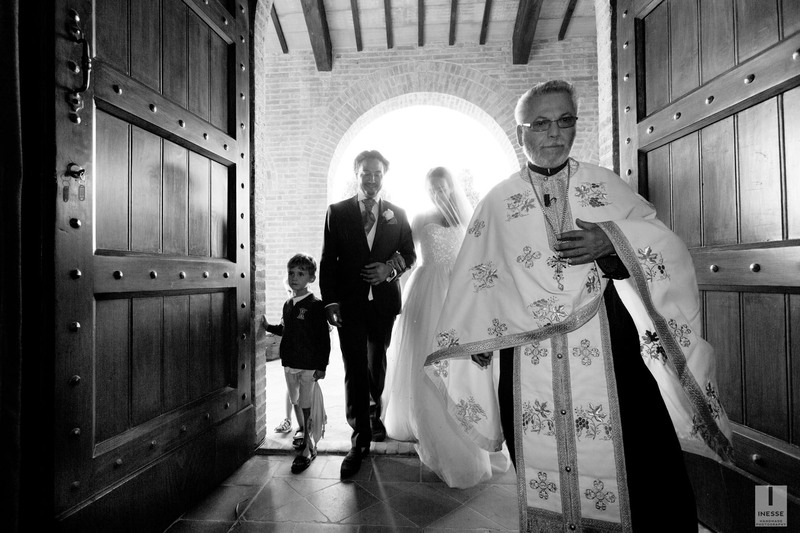 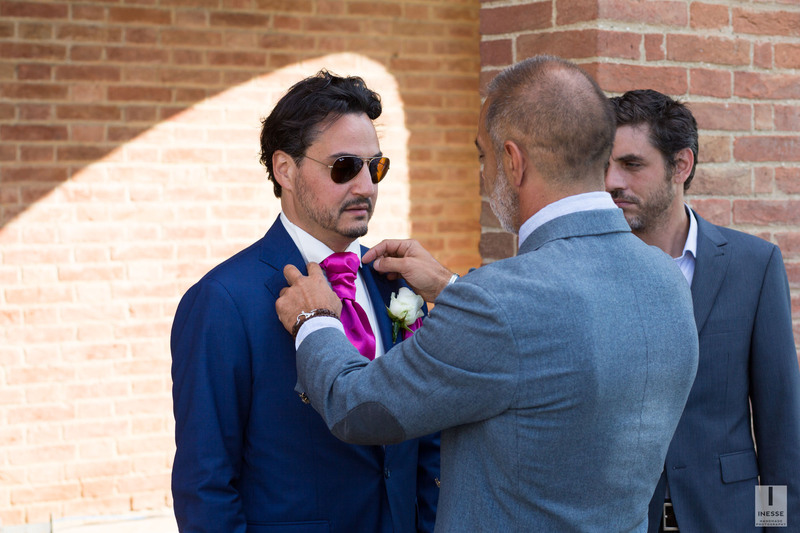 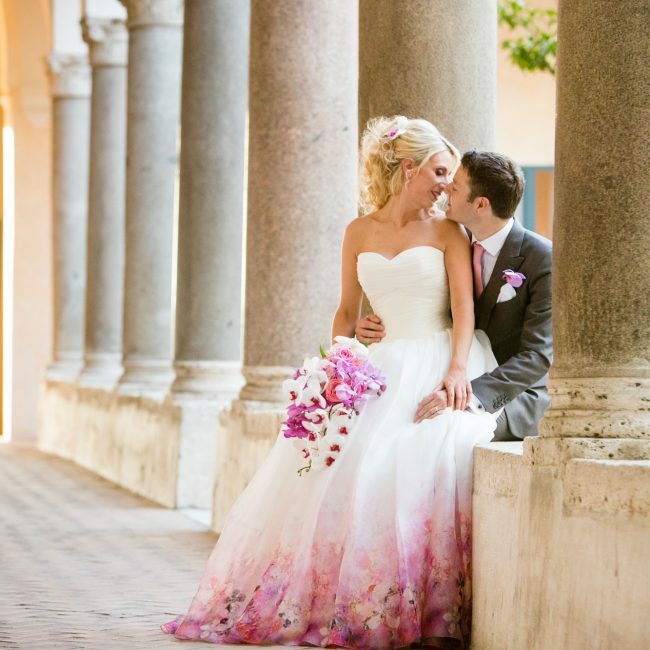 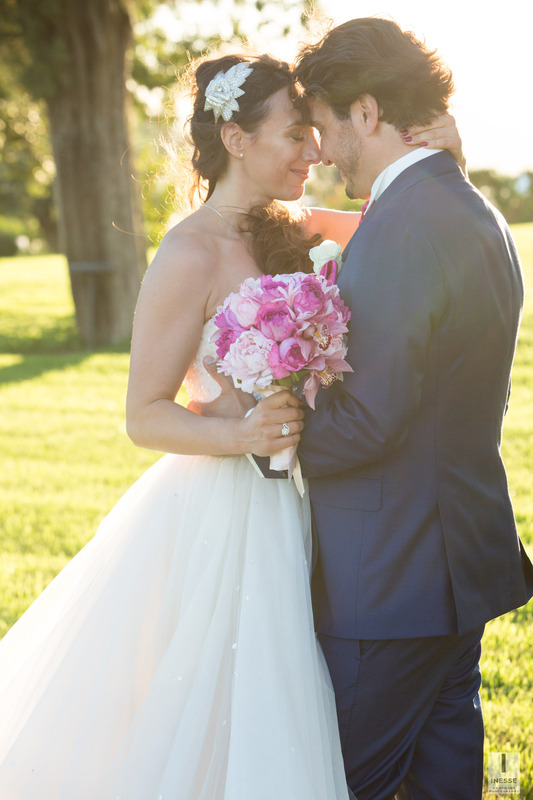 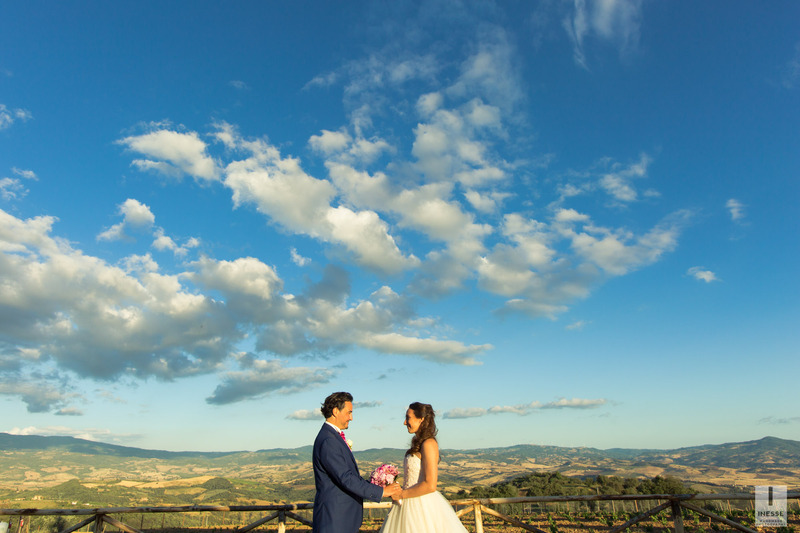 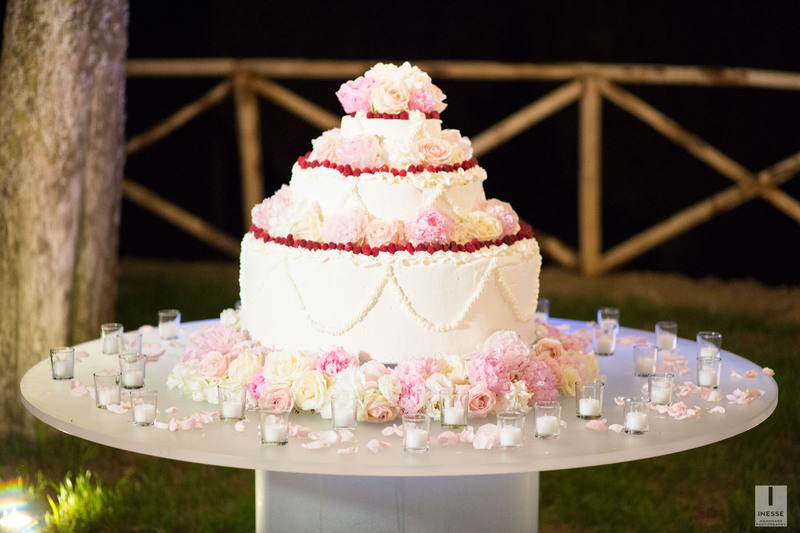 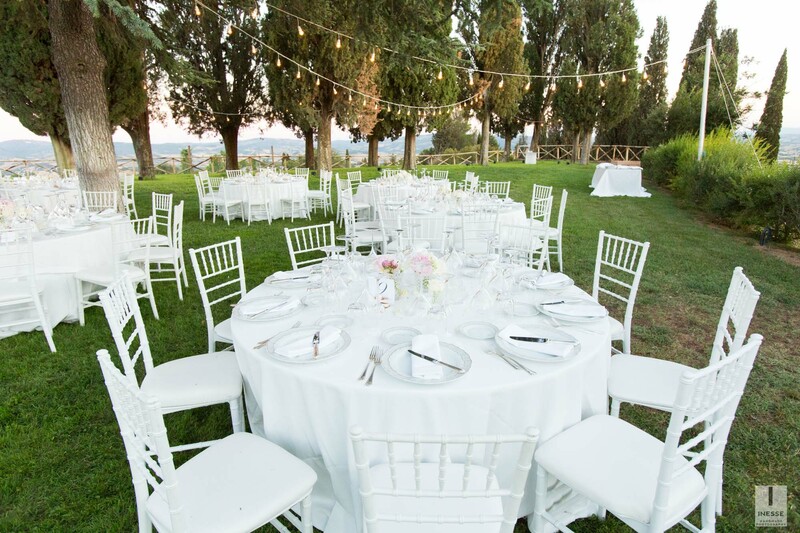 INESSE Handmade Photography is an Italian wedding photographer and videographer based in Rome that works throughout Italy, like Tuscany, Apulia, Umbria, Italian Lakes. 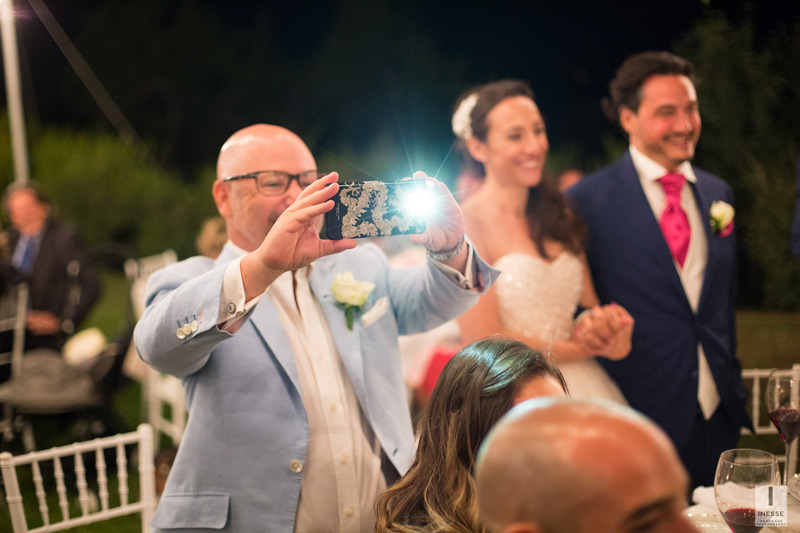 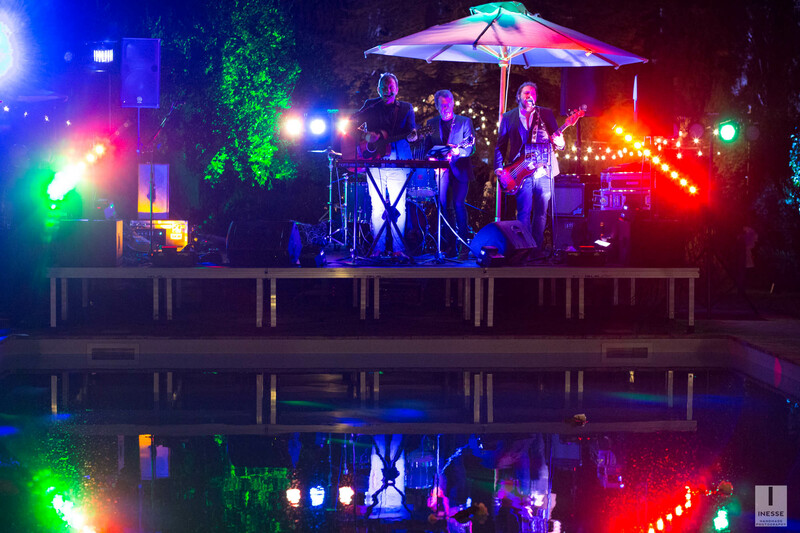 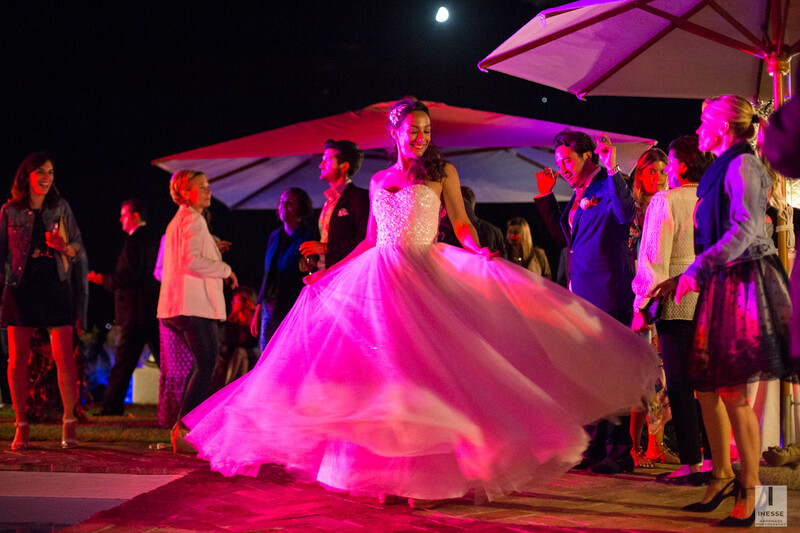 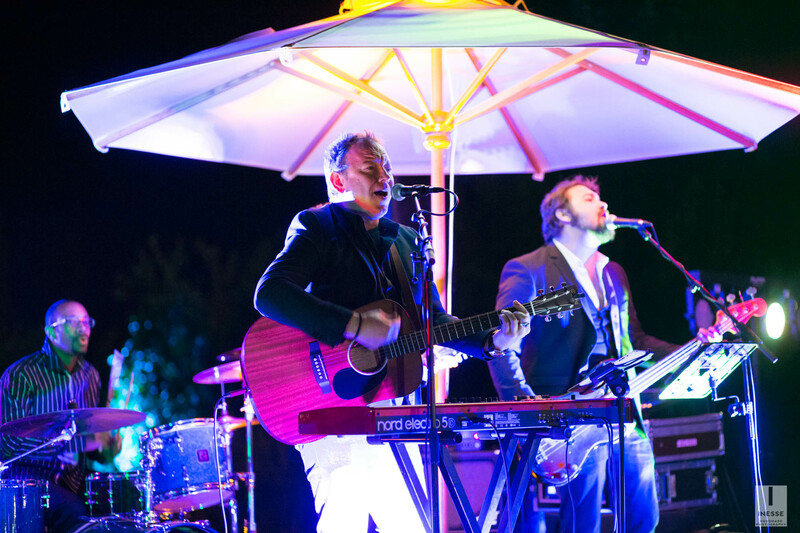 We are known for wedding photography, but they also provide photography services for private and corporate events.